This kind of game can be a difficult one to judge. On the surface, you have two 7-5 teams playing in the Belk Bowl. Theoretically, they should be well matched. Neither team is exceptional. But, at the same time, neither one is bad. They are both capable but far from perfect squads. However, there is going to be one major difference between the two. One has steady leadership ready to guide the team to victory. The other has an interim coach in charge that is usually running the tight ends and special teams. Of course, coaching changes happen all the time before bowl games, and teams still play well and even win. So, the coaching change could mean nothing. It’s not like Texas A&M’s players are going to forget how to play just because Kevin Sumlin isn’t running the show anymore. Players do play for their coaches. But when it comes down to it, they play for themselves, their teammates, and for love of the game more. If there is anything that can be said about football players in Texas—they love the game. That’s not to say players in North Carolina don’t love it. But the ones that play for Wake Forest have been doing something Demon Deacon fans are not accustomed to—winning. Before last season’s 7-6 finish that included a win in the Military Bowl, they had not finished with a winning season since 2008. They already have consecutive winning seasons for the first time since 2006-08. With a win over Texas A&M, they can have their first eight-win season since ’08. But Texas A&M would love to bridge the Kevin Sumlin Era and Jimbo Fisher Era with a bowl victory for the first time since 2014. It’s hard to judge Texas A&M’s offense due to the quarterback issues they’ve had this season. Kellen Mond was not someone who should have been starting as a freshman. Whether Nick Starkel should have been starting is in question as well, but he is certainly the better passer of the two. But neither completed 60 percent of their passes (Starkel—57; Mond—51.5), so that isn’t saying much. 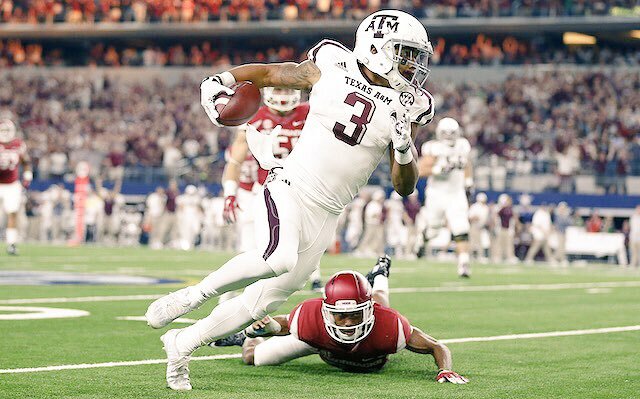 It’s a shame the Aggies didn’t have a better quarterback since they will likely lose the services of one of the more talented wide receivers in college football, Christian Kirk, to the NFL Draft. This season, the Aggies have taken more of a run-first approach with their talented backfield duo of Trayveon Williams and Keith Ford. 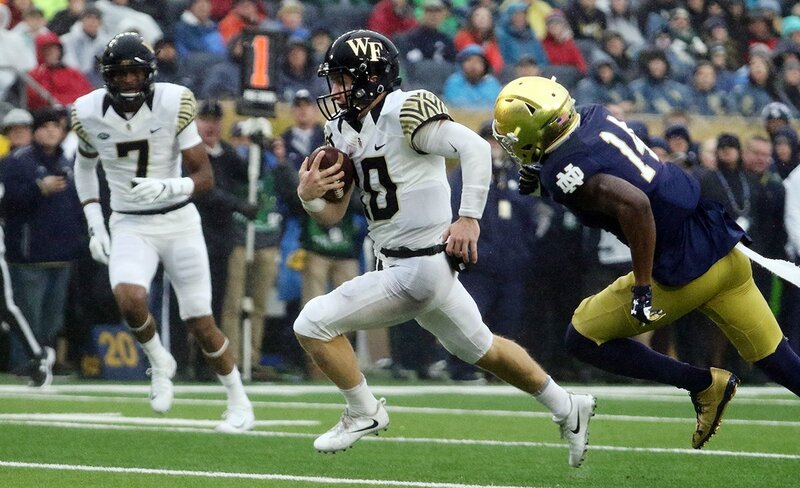 Wake Forest happens to struggle against the run (No. 91; 191.7 yards/game allowed) so the Aggies could take that approach again. Then again, the Demon Deacons are not good against the pass either (No. 103; 252.6 yards/game allowed). But the better question may be whether the Texas A&M defense can withstand the Wake Forest offense. The Demon Deacons appear to have the one thing the Texas A&M defense struggles against the most—a dual-threat quarterback. John Wolford is a four-year starter who completed 63.7 percent of his passes this season for 2792 yards and 25 touchdowns with only six interceptions. He also had 615 yards on the ground and another ten touchdowns. But slowing him down will not be the only key to beating Wake Forest. The Aggies will have to limit junior running back Matt Colburn as well (145 carries for 754 yards and six touchdowns). Texas A&M has shown flashes of brilliance on both sides of the ball. They’ve shown the ability to play great offense and shut down defense. But they failed to measure up against the ‘better’ teams on their schedule. Wake Forest didn’t play as many tough teams as Texas A&M did, but the ones they did play, they lost to (much like the Aggies lost to their tough opponents). Neither team is an easy one to choose, but since Texas A&M can shut down the Wake Forest offense by controlling Wolford, they might have a slight advantage. They did manage to control the last dual threat they faced (Ole Miss QB Jordan Ta’amu). If they can limit Wolford and get their own offense going, Texas A&M will win the Belk Bowl. Wake Forest is favored by three. But look for the Aggies to win by three instead.